Richard Bonehill is a 'Star Wars man-of-many-faces'; he played in both Empire Strikes Back and Return of the Jedi MANY roles. Mr. Bonehill, in both Empire Strikes Back and Return of the Jedi you played various characters; Stormtroopers, rebels, aliens....if you could pick one favorite character, which one would it be? And why? This is an easy one to answer. At the time my favorite part was that of a Rebel Soldier, purely because it was the most comfortable costume to wear. The masked aliens such as Ree-Yees were the most uncomfortable. Over the years I have become very attached and proud to have been a snowtrooper and stormtrooper. The stormtrooper really has become an iconic symbol of the Empire so I would pick him as my favorite character. What would you regard as your best memory from the two Star Wars movies you played in. Is there a special moment you'll cherish forever? And what was the funniest thing that ever happened on the set? One of the things I remember most was the terrible vision in the stormtrooper costumes. The eyes were made of a badly formed misty green plastic. It was like trying to see underwater, only vague shapes were visible. The helmets also tended to move round on the head when you moved this led to many hilarious situations with stormtroopers staggering all over the place. I remember one particular scene in the ice tunnels in Empire Strikes Back where there were about a dozen of us with Darth Vader. We were lined up in a column of two’s. Two were in front of Vader and the rest of us behind him. We were facing an ice wall which was going to explode and we were all to emerge into another ice tunnel. It took all morning to set up the explosion and when it came to the ‘take’ it was a complete disaster. The explosion went off and was so enormous and created a fog of polystyrene that no-one could see anything .Now blind and deaf the first two stormtroopers made it through the explosion and promptly fell flat on their faces. Darth Vader then attempted to make his entrance only to find that the two troopers behind him were standing on his cloak. He gave it an enormous tug and the cape tore away leaving him to appear without half his costumes. The rest of us then piled past him, fell over the first two storm troopers and hit the deck. I was one of the lucky ones who actually made it past the pile of bodies to stagger down the corridor only to find that my helmet was now on back to front! Now completely blind with great style I collided with the wall and fell flat on my back! As you can imagine it was a scene of complete chaos and much hilarity. We did not re-shoot the scene on the same day so I do not know if it was ever included in the film , but somewhere there must exist a wonderful out-take. 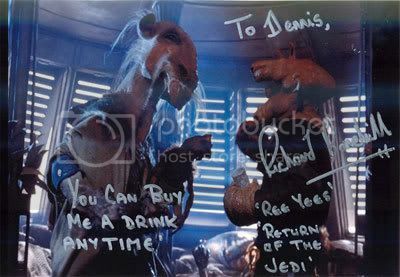 Probably my biggest claim to fame on the Star Wars films is that I was the only extra whose autograph was requested by one of the principles. When some of the ‘regular’ crew of extras were working on the film we got quite friendly with the leading actors. At that time they was a special anniversary edition of The Eagle comic. I had been doing some photo -story shoots and I appeared in a story in this anniversary edition. What I did not know was that Mark Hamill was a great Eagle collector. He recognized me in the comic and was mightily impressed! So in front of all the crew he asked me to sign his copy of the comic!! Isn’t life bizarre !!! Another rather strange story I remember is that one day four of us stormtroopers we asked to do a stills photoshoot with Darth Vader. We were asked by the second assistant director to make a mess of it, dropping our guns, helmets etc. and try and make it last for at least three hours. This did seem very strange at the time but as it meant extra money we did our best to make fools of ourselves! 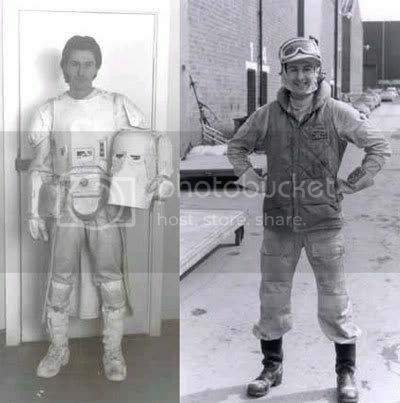 We found out later that the object of the exercise was to keep Dave Prowse away from the shooting stage where the main unit was filming the scene where is helmet was removed to reveal a different actor as Darth Vader ! You're a sword master and member of the British Fencing Association. In both Empire Strikes Back and Return of the Jedi , Bob Anderson did the swordfights. Why didn't George Lucas use you to stand in for Mark Hamill and/or Dave Prowse during the lightsaber fights? At the time of filming Empire Strikes Back and Return of the Jedi I was a top class fencer but was just at the start of my film career. To become a sword master takes many years of film experience. Modern sports fencing is 'light years' (if you forgive the pun) away from stage and film fights. Completely different techniques are required as well as a knowledge of camera angles and techniques. Now when I work on a production I work closely with the actors, director, cinematographer, costume designer, production designer etc. etc. To give you the short answer I would have been completely under qualified for the job. It would have been like asking a normal driver to drive in a Formula 1 race. Of all the movies and series you have worked on, which are you most proud of? And why? The next one. As I hope the fights will look more dangerous and exciting then I have designed previously. I am attending the BAFTA premiere of Sharpe's Challenge next weekend and I will be very interested to see how it looks. Besides working on movies, you have done some conventions over the years. What is your most memorable experience regarding conventions? And what is your opinion on conventions? I was astonished on attending my first convention at the enthusiasm and depth of knowledge of the people attending the event. In fact after appearing at my first convention I did do a lot more 'home work' so that I could answer questions more intelligently. I love to travel so I enjoy attending conventions but obviously given the choice I would rather be working on a new production. However attending events I have made many new friends and I am very pleased and surprised that films I worked on twenty-five years ago are still such highly regarded.